Be the first to share your favorite memory, photo or story of Hilda . This memorial page is dedicated for family, friends and future generations to celebrate the life of their loved one. Hilda Matos, of Daytona Beach, Florida, was born on January 2, 1927 in New York, New York to the late Lupe Sanchez and Maceliano Matos. She was fortunate to have a stepmother, the late Leonora Matos. Hilda graduated from Fashion High School in New York. She worked at Beth Isabel Hospital as a Nurse Assistant. She attended Fordham University where obtained her Social Work degree and was employed at Joint Disease Hospital in New York. Hilda was so great at helping people that she was hired by ILGWL Union where she finished out her career. Retired at sixty-seven, Hilda relocated to Puerto Rico in order to take care of her parents where she joined Iglesia De Cristina and soon after was baptized. In her later years, she became a member of New Mount Zion Missionary Baptist Church, which was located at her final place of residence in Daytona Beach, Florida. Hilda was a loving and devoted Mother, Sister, Grandmother and Aunt. If you need some guidance in order to get things going in your life, Hilda was the person to speak to. She was a very special woman who never passed judgement and didn't care who you were. Her one and only concern would be to assist you on the road to success. On Sunday, November 18, 2018, Hilda Matos departed this earthly life in Florida. She was predeceased by her siblings. 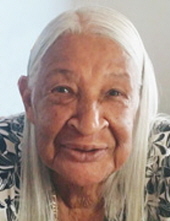 Hilda Matos leaves to cherish her memory, her five children and their spouses: Dianne Pitts, Aaron Pitts (Serena), Mary Taylor, Claudette Spencer Edwards (Stanley), and Claudine Spencer (Samuel); loving sister, Martha D. Robinson; fourteen grandchildren: Musa, Mark, Suliaman, Ismaila, Dhuha, Tchai, Naimah, Michael P., Michael G., Aaron, Jr., Latoya, Aatika, Hager and Samuel, Jr.; 27 great-grandchildren; and a host of nieces, nephews, cousins and dear friends. Hilda, Words will never explain our pain. We will miss your soft touch and words of motivation. You up lifted and inspired us with common knowledge, and expertise; You were God fearing, to say the least. When I was sad, you'd always say, "Smile. Why do you have a frown on your face? You're smart and beautiful. Don't worry about making me proud. You've already made me proud." You continued to be pleasant, beautiful and always gave us hope. Your touch was like silk, satin strokes. No need for tears, I'm here. Love is in the air. There's nothing that you can't do; always compete. I'm happy that you made me the woman that I am. You were my hope in the darkness. I believe in love because of you. Together, we are all free of sadness. Suffer no more; your legacy shall live on, God (Allah) make room for the queen of them all. To send flowers or a remembrance gift to the family of Hilda Matos, please visit our Tribute Store. "Email Address" would like to share the life celebration of Hilda Matos. Click on the "link" to go to share a favorite memory or leave a condolence message for the family.